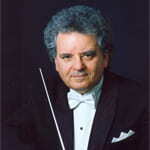 Uriel Segal was Music Director of the Chautauqua Festival in New York State (1989 –2007), Founder-Chief Conductor of Century Orchestra Osaka (1989–1997), Music Director of the Louisville Orchestra, in Kentucky USA (1996 – 2004), Principal Conductor of the Philharmonia Hungarica and the Bournemouth Symphony, Music Director of the Israel Chamber Orchestra and Principal Guest Conductor of Stuttgart Radio Symphony. Segal is a native of Israel and lives with his family in Tel Aviv. His winning of the First Prize at the International Mitropoulos Conducting Competition in New York (1969) led to invitations with major European and American orchestras, among them the Berlin Philharmonic, Royal Concertgebouw, London Symphony, London Philharmonic, Orchestre de Paris, Chicago Symphony, Pittsburgh Symphony, Detroit Symphony, Israel Philharmonic and the Jerusalem Symphony. In addition to his duties as Principal Guest Conductor at Indiana University’s Jacobs School of Music, Segal conducts regularly in the USA, Europe, Israel and South Korea. Segal has recorded for London-Decca and for EMI with the English Chamber Orchestra, London Philharmonic, Philharmonia, Orchestre de la Suisse Romande, Bournemouth Symphony, New Zealand Symphony, Century Orchestra Osaka, and with renowned soloists Vladimir Ashkenazy, Radu Lupu, Alicia de Larrocha and Rudolf Firkusny.